How can I forget the past when it still hurts me? How I feel after the 10,000th time someone asks about the servers without reading the announcements. I know I have probably derailed a thread, never on purpose I just like to joke... but knowing I am a possible cause to the clutter, i'll cut it back. It gets better- much better. The new season is getting good as well...I'd give it a shot. What I like about TWD is the not knowing how it started, I suppose that's probably why I didn't take a liking too FTWD. I wanted to add this to a post but thinks it belongs here. A lot of threads have been derailed or cluttered up, mostly with memes, that eventually lead to nonsense throughout the thread. So I politely ask, that if you feel it necessary to post a meme please do so here, place a link to the thread along with it, so we can see it in context. This is especially important for some of the more serious sections, such as general Discussion and Suggestions, or any other section that may have a direct impact on the way the devs implement any ideas and feedback from the community. Cheers in advance for your cooperation. 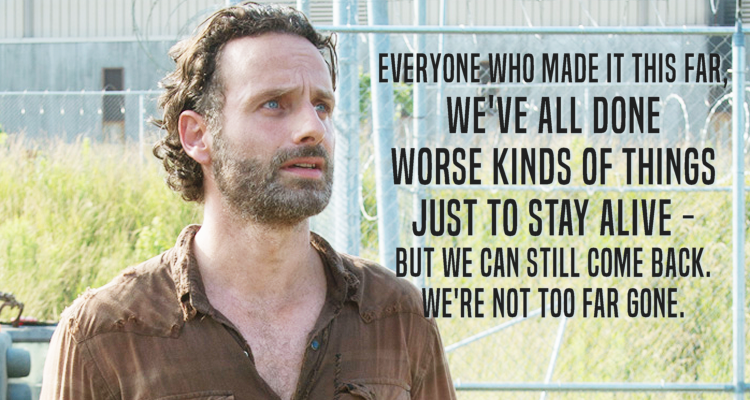 Yeah I'm really sorry about all the Rick Grimes faces... I will continue to just post or message or comment normal messages, but don't take offense if Occasionally I put one pic of rick grimes on here. I know I have been a little excessive with the last few. Again I am sorry mate. Just a quick question and this meme/quote does kinda apply in my opinion. Can the player going completely insane so fast, maybe instead in time go insane and suicide? Rather than after 4 kills on a server commit suicide or however many. Maybe instead have some kind of balance? I am not gonna lie, I actually hate killing/ being killed constantly in a game where survival is the main base. But Sometimes you have to "defend yourself" or "survive". In some cases you might meet some nice people and join together for an adventure, but in other cases you might find a guy who is securing his "home base" and try killing anything that walks/runs/creeps by. I would love to stay alive as long as possible as the rest of the people playing or going to play this game but maybe have some measure as to how long it would take or how many to kill before offing yourself in insanity. There should be some way to come back from the voices in your head and survive longer from it. Maybe Medicine? or some kind of remedy to craft or maybe just taking a break from "defending" or "surviving" the KoS or attackers. I believe there are going to be things in place to help with your characters mental health, but they won't be OP, otherwise KoS won't be deterred too much. I think things like being warm/comfortable, eating well prepared (hot) meals etc may help with some of the characters issues. Right I can agree I mean if some guy/lady is literally killing people left and right and using some kind of thing to keep himself sane that would be a little redundant. But to be able to survive and kill an attacker of sorts once in awhile would be okay. Everyone has to do things that they don't always want to do in video games and I think this would help KoS people maybe not be so apt to just be suiciding constantly. Like I said I definitely do not want to kill people all the time. But it would be good for PvP and maybe keep people a little more in the safe zone. But there should maybe be some kind of counter-act. If you kill 3 people while "keeping meditated" then it should not work but if you kill a guy and an hour goes by with keeping yourself maintained then maybe it goes away in a sense? Basically some way to Balance the good and the evil. But in no way do I mean I would like to see people just killing and getting away with it. I am reentering darts again after 20 years. I have aims towards PDC Canada/US i know i can beat some of the better players, but practice is my goal the rest of this season. I would be 10 yrs younger then Phil Taylor, which is old in standards i am aiming for. P.s this is my Favorite player, he has worked so hard as the youngest player ever to win a masters... https://twitter.com/MvG180 at the age of 17!!!! !